The second generation of MP3/CD-players can do everything that we have expected from the first players which supported sound compression. Why has it happened only now? Players based on a flash-memory or hard discs were initially expensive devices. In order to justify their high price, the manufacturers furnished their players with as much functions as possible. That is why there was a support for nearly all bitrates from the very beginning, and ID3-tag displaying even in the first models, and struggle for convenient handling, and upgrade possibilities (new compression standards, new sampling frequencies, new functions - everything for an end user). You know quite well what it resulted in. The situation with MP3/CD players was completely different. A CD is not a very convenient data carrier but on the other hand it is the cheapest. It crushed the competition among electronic systems on the spot: the development of a new stuffing was expensive that is why not every company could manage to do it. A necessary set of chips was already developed in 1999. It had a lot of drawbacks but still managed to make the difference between CD and MP3/CD as little as possible. That is why all the limitations of the first generation were connected with making the production cheaper. Some companies were developing their own controllers, and Philips managed to do the best model. Expanium had nearly all features which you can find today in many second generation devices. We just have to wait until the second generation displaces the first one. Today in our lab we have the MiSEL MPJuke-2000 model (MJ-2000) from a Korean company, MultiChannel Labs Co. Well, let's examine it. 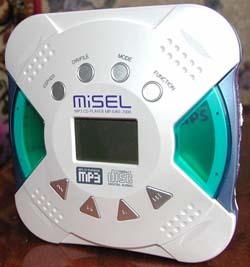 Well, the device is a typical model of the second generation MP3/CD players. So, first of all, there is a full and documented support of CD-R/CD-RW discs, including multisession ones. The previous players were often incompatible with these discs, but today's players support them easily (I should note, though, that some G1 players had unofficial support of such discs). The player supports both standard discs and 80 mm ones. The player is equipped with quite a big graphics LCD. What for? Firstly, for displaying the contents of ID3 tags. Secondly, the player has a convenient system of directory navigation. The manufacturer calls it EDA (Easy Directory Access). By the way, long file and directory names are displayed entirely, the disc can contain up to 254 directories with a nesting level up to 32 containing 999 files totally. Well, you can listen all the files one after another (like in the G1 players), or you may choose only the marked ones for playing. What is the device able to play? Today it can play MP3 files with a bitrate from 8 to 320 Kbit/s (both CBR and VBR). Files are defined according to its extension, as before, but now it is not only MP3: files with MP2 and MPG extensions are also supported. Of course, normal audio discs are not left aside. 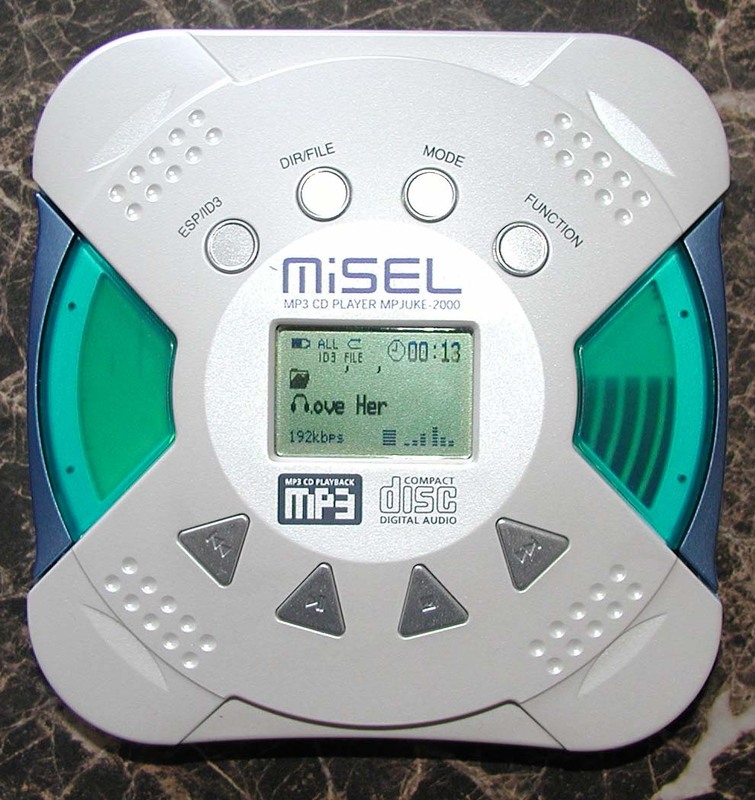 The player contains an anti-shock buffer, which is enough for 10 seconds of AudioCD and 50 seconds of MP3. Comparing the figures, one can see that for MP3 the buffer size is specified for 256 Kbit/s files (it means that for the most popular 128 and 160 Kbit/s bitrates the anti-shock should be approximately half a minute). Other information on modernization of the integrated software and other compression standards is absent, but since such modernization is supported by the chips used, new firmware versions for the MiSEL should appear in the nearest future. After being decoded, the output stream can go either to headphones or to the linear output. It is not a new feature. But the sound preprocessing is made differently: instead of using a preset equalizer, one can manually adjust high and low frequencies. Now let's discuss the new player in details. The MJ-2000 is enclosed in a small cardboard box. The supply set is not very rich. Apart from the player, you can find an AC power supply unit, a pair of batteries or accumulators, headphones and a User Manual. That's all, even the cable for connecting home equipment is absent. There is not much we might say about all these components. I just want to note that the headphones are too cheap to enjoy the music (though, they are a bit better than those usually supplied with such players). As for the User Manual, it should be noted that this small 24-page booklet of A6 format is the best manual I have seen before. Everything is clear and competent, nothing is missed. There is even an LCD scheme and a detailed description of how the player forms a linear playback list. The case of the player is almost symmetric and doesn't have large dimensions: 131 X 135 X 34 mm. The player is now quite thick in the center, (though on the edges it is still 20 mm). It's accounted for by the fact that the lid implements not only protective functions but it also contains a display and nearly all control buttons. 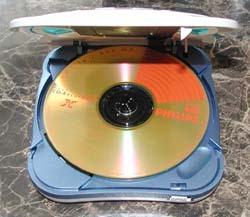 The player weighs 275 g. In fact, it is a standard weight for the majority of CD-players. Moreover, many models for 80 mm discs or Click! still weigh 200 g. So, if you need a portable player - there is only a flash player to take, and if it doesn't matter to you, then 275 g is not the worst result (I had no problems even with MP3/HDD players weighing 400 g and more). On the lower panel there is only a lid of the battery compartment. The front panel offers only an open button. The rear panel has a power supply connector and there is nothing on the left. That is why we will turn only to the right side and the lid. On the right side you can find a headphones jack, Jog-Dial, an "Off/Resume/Hold" toddler and a linear output. When in the last position the toddler locks the keys, the other two positions define the start track after the player is restarted. If the toddler is in "Resume" position, the player starts playing from the last played track, and if it is in "Off" position it starts from the first track on a disc. It is not a new approach - the previous generation used it as well. What is Jog-Dial? This round swinging button implements a lot of functions. If the playback mode is off, it serves for navigating through the list of files/tracks/directories (the same functions as of "Back" and "Forward" buttons). While listening to the music it allows adjusting the volume, level of high and low frequencies, and their frequencies as well. When pressed once (or without pressing), the button helps to adjust the volume level (within the range of 0-50). Two or three presses adjust the level of high or low frequencies (0-12 range). 4 presses allow to choose the bass frequencies among 50, 100 and 200 Hz. When pressed 5 times, the high frequency can be selected among 2, 4 and 7 KHz. Now the lid which is the richest place - 8 buttons and an LCD. The lower raw consists of 4 triangular buttons: "Back", "Play/Pause/Power On", "Stop/Power Off" and "Forward". The upper raw includes 4 round buttons: "ESP/ID3", "DIR/File", "Mode" and "Function". The latter is used to choose the playback mode: a normal playback, Repeat mode, Random mode and Intro one (10 seconds of each composition). The range of playback is set with a "Mode" button, and the variants available depend on the loaded disc (AudioCD or CD-MP3). On the whole, what you can get with the other buttons also depends on the mode that is why I'm going to speak about it a bit later. The only exception is switching on/off with the corresponding buttons. The display is 35 X 24 mm, apart from symbols it can display 39 latin and 19 japanese or korean letters. The display has a backlight, but it doesn't work when the player is powered from batteries. The display can be logically divided into 4 parts (vertically). The left half of the upper part doesn't depend on the working mode, that is why I will describe it at first. Imagine that it is a table of three columns and two lines, let's move from left to right. First, there is a battery status indicator. To its right you will see what is played: all tracks, a directory, a file or files from a playlist (for an AudioCD only the first and third variants are possible). The next position displays info on how the playback is carried out (switching is made with a "Mode" button). In the second raw on the left there is a sign saying that the player is powered from a power supply unit. The next position says whether the anti-shock is on (for AudioCDs; for MP3s the anti-shock is always on) or ID3-tag displaying. In the first case you will see "ESP", in the second - "ID3". The last position is used only for discs with MP3-files and shows the level we are working at - with directories or files. It is the first feature the user faces loading a disc. Let's assume, therefore, that a disc with files is inside the player. 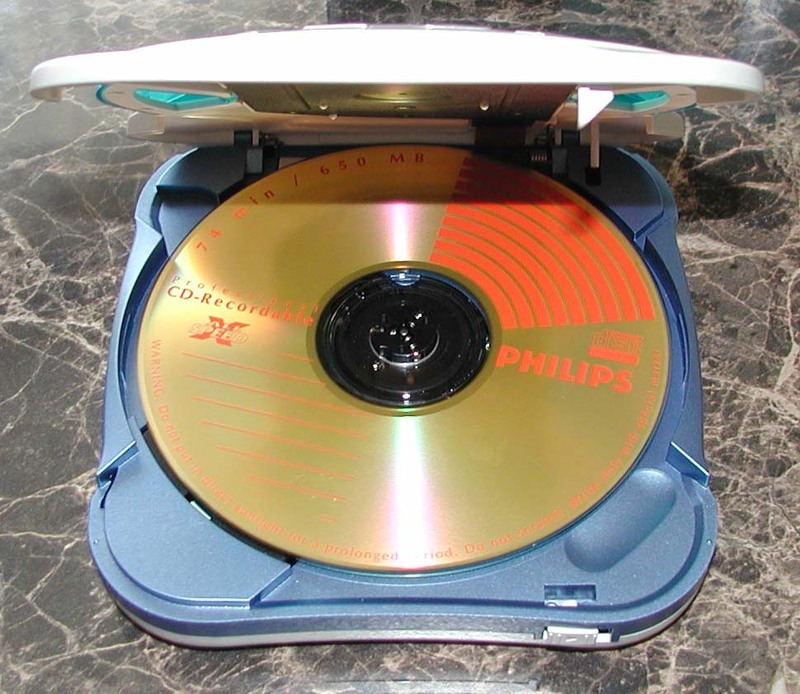 With a disc inside, power on and before the playback the display lets us see a linear list of directories on a disc. In fact, there are only three lines: for a current fragment (file or directory), the previous and the next ones. If the length of the current line exceeds 13 symbols, it will be running. You can move along the list with Jog-Dial button or with "Back" and "Forward" ones. The "Play" button will help you to enter the directory, and with the "Stop" button you can enter the upper level. If you enter a directory its name will remain in the second line (with an open-folder sign), and scrolled files can be viewed in the remaining lines. The manufacturer has released us from cobwebs of the file system having linearized the directory tree. The first element of the list is a root directory, which is followed by all directories located right in this one (alphabetically), then there are all directories of the second level etc. The directories with unsupported files are not displayed at all. So, we have a list of all not empty directories and lists of files in each. You are to choose the one you need, press "Play" and switch a playback mode (a bit later on it). By the way, while navigating through the list of directories, in the right upper corner you will see the number of the current directory and the total number of directories on the disc, and when navigating through files - there'll be again the number of the current file and the total number of all files on the disc. As for an AudioCD, EDA, in fact, works in this case as well, but there are no directories and all the files have names starting from "Track 1". The second line displays a sign of the disc type and an inscription "Audio CD". In all other respects, it is all the same. The left upper part of the display is described above, and in the right part we can see a sign of a clock and the current playback time. In the second line you can see a disc and a mark "Audio CD", in the third one - "Track N" (N is a number of the current track), in the right half of the fourth line an equalizer status and a volume level are displayed in a graphics mode. When working with Jog-Dial button the left part of the line shows which parameter you are adjusting and its value in figures. Now about the buttons. The "ESP/ID3" switches on/off the anti-shock (it is off at default), the "DIR/File" doesn't work in this mode, and the "Mode" allows to set whether all tracks will be played or only the current one. The way of playback is set with the "Function" button. Now comes the lower raw. To make a pause you should press the "Play" button, with the "Stop" one you will leave the playback mode and come to the EDA, and the other two buttons, when pressed and released, will give the previous or the next track, and when pressed for a longer time, they will wind the current track forward or backward. As for the sound quality, I must admit it is quite good, both with headphones and through the linear output. The anti-shock is more than enough when you are walking, but 10 sec are insufficient for jogging lovers. When the anti-shock is off, it isn't worth using the player when you are moving, though some players allow to do it. The only thing I didn't like was a bit low volume level for AudioCDs. For MP3 the problem is absent, that is why we might possibly conclude that the output power is artificially set too low. Everything we have said about handling of the player works the same way here. The only serious drawback is impossibility to rewind a file. What else is different here? First, in the left half of the lower line we can see the bitrate of the current file. Unfortunately, we failed to find out what happens with songs which have a variable bitrate. The other values are accurately displayed. Secondly, right after reading the info on a disc we can see a label of the disc, the number of files and directories. Later you won't be able to see it. The "ESP/ID3" button now switches on/off the anti-shock, and defines the song's name from a tag or a file name. The "DIR/File" button is also meant to switch these modes. What do they differ in? In "File" mode the pressed "Back" or "Forward" buttons will help you to jump to the previous or the next track in the same directory, and with the "DIR" button you will get to the first file of the previous or the next directory. Now with the "Mode" button you can also play files from the current directory or from a playlist. It was the last difference of this player from the first generation. What is a playlist? It is a virtual directory with up to 50 files on a disc. It is simple to add a file in it: you should press and hold the "Play" button for 2 seconds while playing it. The deletion is carried out the same way. Now a couple of words on the anti-shock. In order to save the energy, a CD-MP3 is not rotating permanently. On loading up the buffer the engine stops, and when the buffer becomes empty, the engine starts up again. So, if you shake a player at this moment, the sound will break for a short time. Other manufacturers of the G2 players have announced the readiness to produce firmware versions with a manual choice possibility: whether to stop discs or not. What will be with the MiSEL is still unclear. 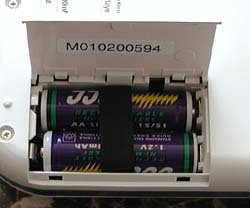 The MJ-2000 is powered from two AA batteries or accumulators. The player takes a lot of energy to work. After 5-6 hours of working you should change the batteries. The most unpleasant thing is the absence of a recharging unit :( That is why I tested it only with batteries. Well, the MP3/CD player of the G2 is quite successful. The worst drawback of G1 players - restriction of the bitrate from above - has gone away. Is the MJ-2000 model a good purchase? It is difficult to say now since there is nothing to compare with. Now a lot of expensive models have appeared on the shelves. In some time their prices will drop. That is why it is worth waiting a bit. Maybe new models with a built-in recharging unit will appear on the market soon. 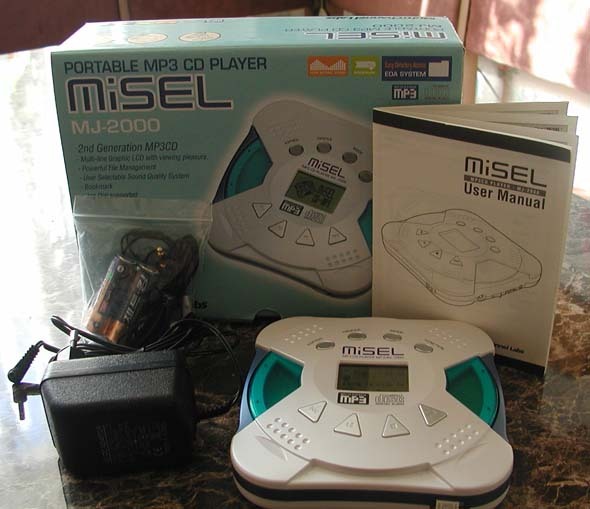 Maybe we will see a backlight working in any conditions etc… But if you need a player right now - the MiSEL MPJuke-2000 is not the worst choice.